It’s the best game for all the mobile platforms and no doubt, it is for your HP Touchpad, too. Angry Birds has gained a lot of popularity. If you have played it on other mobile platforms then why not check it out on your HP Touchpad now? Unlike other mobile platforms, this is free for your HP Touchpad. Not because you are going to have ads in it but it’s ad-free too. If you like blogging, this is an app you are waiting for. This app has all the features of the Wordpress Blog like notifications, multi-blog access etc. It’s better than the iOS and Android versions. So, get connected to thousands of blogs with the help of this app. You love your Touchpad and How about playing “Need for Speed” on it? You are surely going to like it. There are 20 different vehicles and 15 different police cruisers that you have to unlock by winning some races. You can go by the law and crack down speedsters or you can race by going against the law. It depends upon you which you would want to be. The game costs $9.99 and it’s worth it. It has all the features that will make your racing quite a fun. Facebook is the largest social networking website and you probably are one of the users of it. You want this app on your HP Touchpad and this app is here for you. You can view photos, comment on them, like the wall posts and you can do many other things by having your Facebook right under your fingertips. It also syncs your photos and contacts with the other apps. All the basic features are easily accessible. You will like it. There are no charges. Facebook app is free to download. The easiest way to get the pictures you want. Whether you want it from Google, Picasa, PhotoBucket or Bing, you just need to start this app. Then type the name of your search item and choose from where you want this app to search and you are done. This app will give you all the images related to your search in a moment (depending upon your net speed). Pix is free to use. You have some guests coming at your home and you want to cook something new or you want to cook something delicious and new for your family on a holiday, you should try this app. It contains thousands of recipes including Chinese, Thai and from all around the world. You can also browse the meals. It will tell you the ingredients so that you can shop easily. You should try this app. 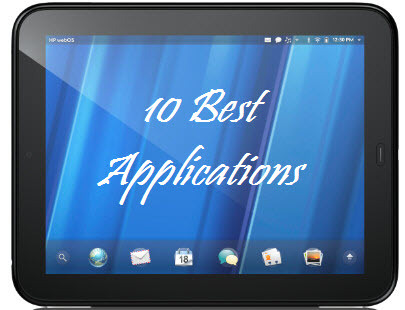 Here is another amazing app for your Touchpad. “Interface Lift HD” lets you search the wallpapers for your HP Touchpad. You can browse them by category or you can see what’s new in there. A huge collection of wallpaper is available so you can choose the one that is eye-catching and suits you. This is a really nice experience and you are going to enjoy it. Interface Lift HD is free. Download it today. Khan Academy is one of the best apps for your HP Touchpad. If you are a student, you don’t need to go to other academies and if you are a teacher, you should guide your students to use this app. There are more than 2300 educational tutorials that will help the children learn easily. This is the first app by Khan Academy and they have launched it for Touchpad. The app is free, too. Check it out for yourself. Looking for a number of some important persons on your life? Want contact information of the person you are going to have appointment with? Well, no one can better help you like this app. grab this app as soon as you can. “White Pages” is free to use. Box.net is an excellent app for your touchpad and it’s worth mentioning here. You can get 50 GB of free cloud storage (if you are a new user). That’s huge. You can store whatever you want, wherever you want, easily. The app is free. Download it now!